Tufts has not yet negotiated a contract with the dining workers’ union, almost nine months after workers voted to unionize. It is time for the university to do the right thing and respect the requests of its employees. Trisha O’Brien, who has worked for Tufts Dining for 30 years, said in an interview with the Daily that the university did not treat its workers well before the vote and that they are not doing so after the vote, either. The workers are demanding better wages and benefits, an end to temporary hiring, respect for seniority in wages and promotions and dignity at work. These demands seek to address problems that have persisted for years, including favoritism and harassment. Some workers, O’Brien noted, got fourteen-cent raises while others got fifty-cent raises, despite starting their employment at the same time. This discrepancy meant wages stayed low for many. “I don’t know how Tufts gets away with it,” O’Brien said of the temporary worker system. Most temporary workers are non-white and at the mercy of a system that often arbitrarily plays favorites. Temporary workers also face the added anguish of continual insecurity. Some have worked here for a decade or longer without benefits. Workers spent thousands of hours of their lives, caring for students, doing difficult and often physically painful work for little more than minimum wage and no benefits. Tufts has proposed a wage agreement to the union that included raising the base wage to $15 an hour, but in the same proposal sought to eliminate the recess pay on which workers depend during the months when Tufts is out of session. This proposal is unacceptable. Some of the health benefit plans provided by Tufts, according to O’Brien, cover less than 70 percent of healthcare costs. Benefits won by unions at other universities in Boston cover upwards of 90 percent of costs. With healthcare costs rising to unprecedented highs, employers who can afford to provide benefits should not leave workers on the hook for huge medical bills. Yet Tufts has done precisely that. In some cases, workers must pay over a thousand dollars a month for healthcare. According to the most recently available tax returns, for the fiscal year ending in 2017, Tufts’ assets grew by $267 million and the school took in $25 million more in revenue than it lost. Claims that tuition increases will result from paying a living wage to a few hundred workers, out of a workforce of 12,311, stretch credibility. O’Brien said during the first round of negotiations that the school seemed receptive to the workers’ demands. But after that their attitude hardened. “It is a war,” O’Brien said of the latest rounds of negotiations. As many as 80 workers showed up to the December negotiations. The school, O’Brien said, didn’t have enough chairs and didn’t care that many workers had to stand, indicating the disrespect some workers feel management shows them. All they want is a fair seat at the table. O’Brien says there aren’t enough managers to help workers. As a result, when Kindlevan Café opened last year it was often short of food and other supplies. This lack of support is part of a pattern of unresponsive behavior, according to O’Brien. Some managers interfere with schedules, and workers feel harassment goes unaddressed. 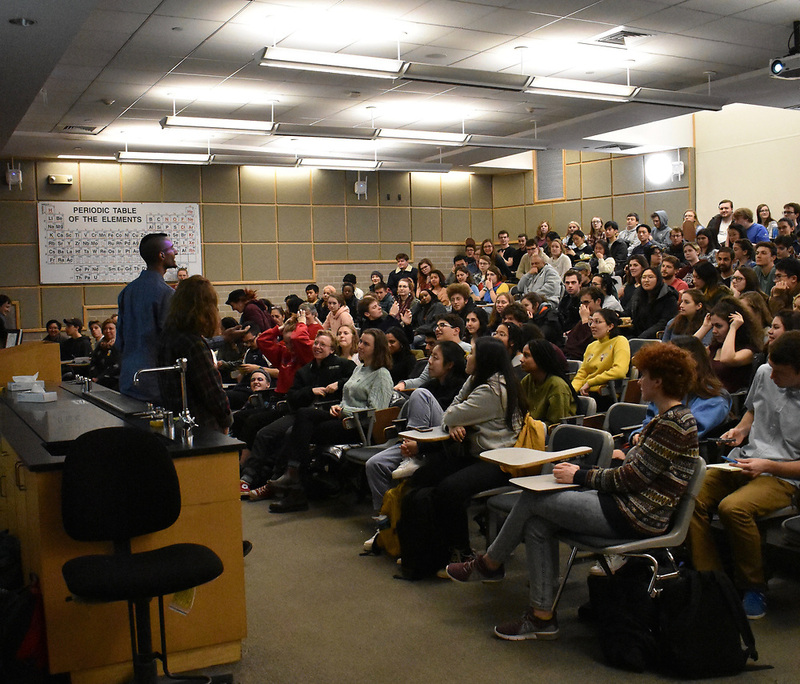 A rally organized by Tufts Dining Action Coalition (TDAC) last November sought to address these concerns through solidarity with the workers who say that university often fails to investigate complaints. Given the stalemate in negotiations, the university has not agreed to proposals to address this. Injustice manifests itself in the workplace in the form of harassment, discrimination and low pay. It is only through solidarity that workers can address these problems. The union fights to give workers power over their own lives. UNITE HERE Local 26, which the Tufts Dining workers voted to join, acts as a force for redistributive social, racial and gender justice by organizing industries with majority non-white and majority non-male workforces. At first, O’Brien said, some workers were hesitant to join the union because they were scared and felt alone. The election, in which 90 percent of votes cast were for unionization, and the negotiation deadlock have strengthened the resolve of dining workers. “I really love my coworkers,” O’Brien said, explaining that this motivated her to fight for the workers’ demands. Last year, hundreds of students marched alongside workers to demand an election for the union. O’Brien wanted to thank the students who had listened to workers. O’Brien said workers see their own children in the students, especially first-years, many of whom are away from home for the first time. The workers make students feel at ease and help them adjust, making Tufts a more welcoming place. Tufts students should stand with the workers and show them our support through actions like wearing TDAC buttons and telling the workers we stand with them. We owe them our solidarity, not because they serve us, but because workers deserve human dignity and respect.